What price would you pay to breathe? Wow! Just wow! What an absolutely brilliant, mesmerizing ride! The Crescent Stone is a thrilling journey of trials, challenges, and redemption in a magical world. Madeline Oliver is dying from a disease that ravages her lungs, filling them with scar tissue. She’s rejected her boyfriend, lived through the stages of grief (mostly), and grasps at normalcy by attending her high school classes. She’s surviving pitying looks, the kindness of strangers, and the distant love of her parents. When Madeline is offered a healing in exchange for a year’s labor, she accepts the gift of life, not knowing the true cost of the exchange. Jason Wu comes to Madeline’s aid when she faints in chemistry class, beginning a friendship that he clings to for redemption from old mistakes. While Madeline is a wonderfully strong heroine who matter-of-factly accepts that hers is a road she must walk alone, it is Jason’s wit, truth, integrity, loyalty, and perseverance that light up the story. He also provides comic relief even in the direst moments of their adventures, whether it’s his costumes, his truth-telling, his fighting prowess or lack thereof, or his beloved unicorn steed (i.e., a rhinoceros), Delightful Glitter Lady (aka DLG and Dee). Luckily, Jason has a magical embiggenator to shrink or enlarge Dee as the circumstances require. As the fool, Jason draws our eye to wisdom, as Madeline draws our eyes toward courage and justice. Jason and Madeline have embarked on a journey that will take them beyond our planet to the magical world of a beautiful people with dark intent, a war-loving race seeking justice and revenge, and two mysterious and mythical kings, one a peasant, one majestic. It is a world fraught with bodily peril and soul-searing revelations, courageous warriors, walking legends, and social injustice. It might just be a world where Madeline and Jason, along with their companions, can be heroes. Grab your Kleenex box and your highlighter, because The Crescent Stone is going to grab your heart and not let go, and the pithy quotes will endure a lifetime. You will race your way from adventure to adventure, from revelation to revelation, and from defeat to triumph. Friends will become enemies, and enemies will become staunch friends as plots and hidden motives are revealed, and the story turns from light to dark and dark to light. Don’t miss the legends and stories in the appendix; they’re as meaningful and wise as the main tale. As some stories end, “this story bears three gifts: one for the storyteller, one for the hearer, and one for the heart which understands.” Dear reader, these gifts are for you and me. We leave this story entertained and enlightened beyond measure. I cannot express how much I loved this book, how well it works on so many levels, including as an adventure story and as an allegory. There is so much wisdom and so many insights to be gleaned. Highly recommended for those who love fantasy, Christian storytelling, allegories, and simply brilliant writing. 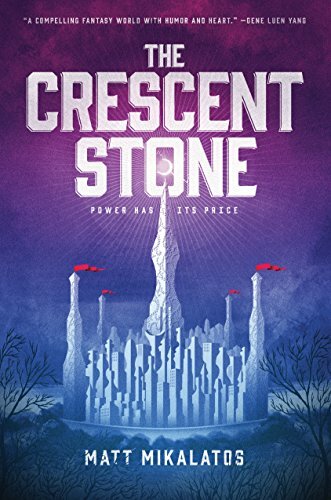 I’ve not read any book by Matt Mikalatos previously, but I’m so taken with The Crescent Stone that I’ll be grabbing the sequel when it’s published and checking out his previous work while I’m waiting. I believe Mikalatos’ writing is right up there with Tolkien, C.S. Lewis, Brandon Sanderson, and the other fantasy greats. Simply an amazing book that I was sad to put down. I’m already impatient already for the next book, The Heartwood Crown.